Originally presented by The They Co. for The New Museum’s Ideas City Festival, The Powerful Bond (2013) is a multi-channel, ambient installation inspired by light and music cognition. It is comprised of five sound chandeliers, numerous piezo tranducers, LED lights and ten audio speakers. The form of each chandelier is based on the molecular structure of either sapphire, emerald or citrine quartz and utilizes color compatible LEDs in the hues of blue, green and yellow. The frequencies explored are 528Hz (heart healing), 852Hz(spiritual order), an implied binaural beat of 4Hz(deep meditation) and a heart pulse of 60bpm. Using psychoacoustics, binaural theories and various hued LEDs the environment of The Powerful Bond becomes a multi-sensory space that provides the viewer with a unique visual and aural experience. 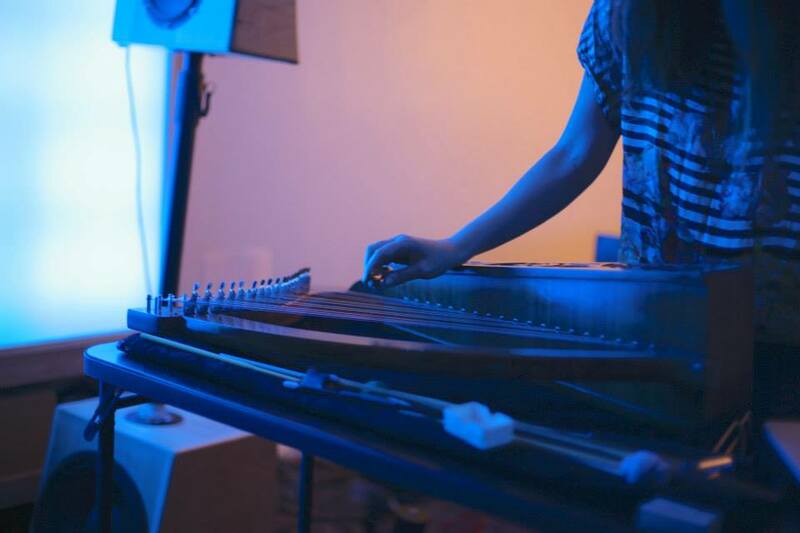 Shelley Burgon is a harpist and sound artist based in New York. Her music centers around the sound of the harp, both as a traditional acoustic instrument in a chamber setting and as the primary sound source for her electronic music. Her sound art focuses on handmade electronic sound and light sculptures that combine scientific theories and mysticism. She received her MFA in Electronic Music from Mills College where she studied with Pauline Oliveros, Fred Frith, Alvin Curran and Maryanne Amacher. Since moving to New York, Shelley has had the pleasure to play and record the music of a broad range of artists that span many genres including Bjork, Zeena Parkins, Anthony Braxton, John Zorn, Butch Morris, Miho Hatori (Cibo Matto), Christian Marclay, Joan LaBarbara, Elliott Sharp and Maria Chavez as well as with bands such as Stars Like Fleas, Elysian Fields and Blondes. Shelley has performed the Whitney Museum, MoMA (Monday Nights), MoMA PS1 (Warm Up), Dia:Beacon, Chelsea Art Museum, White Box Gallery, Silver Shed Gallery, Eyebeam Art + Technology Center and many other venues. Her music has been commissioned by The Merce Cunningham Dance Company for the Hudson Valley Project at the Dia Museum, and choreographer Katherine Behar. Shelley is also a member of the chamber group Ne(x)tworks which features Joan La Barbara and also performs solo under the name Rowan. Comments closed — Trackbacks closed RSS 2.0 feed for these comments This entry (permalink) was posted on Thursday, August 20, 2015, at 10:37 am by Dan Joseph. Filed in press release.